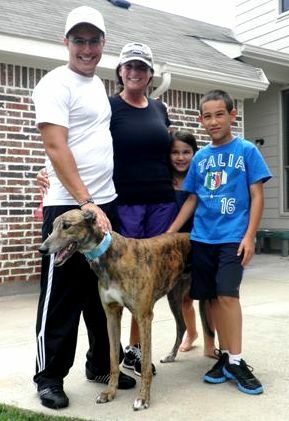 Rusty with his new family, Andrew, Gina, Grayson and Anna. 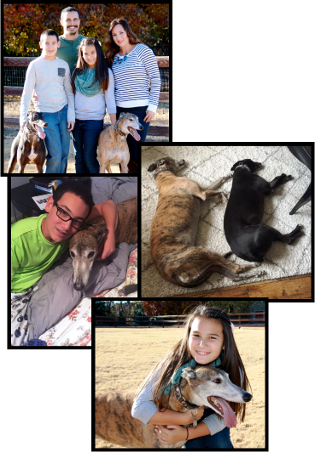 January 18, 2016 update: Rusty went to the Rainbow Bridge. May 22, 2011 update: Adopted! May 2, 2011 update: Will Velcro stick to a rusty surface? I think the answer is probably “yes” since Rusty (who is a VERY rust-colored brindle) sticks to me like Velcro. Rusty’s adjustment from track to house has been immediate. Of course, he does have other Greyhounds to show him the ropes. He planted himself on a dog bed immediately. He followed his foster mom around immediately. He did his business outside immediately. He slept through the night immediately. He went into his crate for a cookie immediately. He picked up squeaky toys (well, some don’t actually have a squeaker anymore) immediately. He walked well on a leash immediately. He “loaded up” in the car immediately. Ooops – the one thing he did not do immediately is leave the other dogs’ food alone. I still hold his collar while I put down the other dogs’ food and tell him to “wait.” At last, he gets his food with an “OK Rusty”. As you might guess, he always finishes first. In order for him not to try to gobble the others’ food, I put him outside as soon as he is finished. This is normal behavior for a dog recently retired from the track or farm. He’ll learn. Rusty does not pull on the leash, which makes him a joy to take to an event. In fact, he likes to go anywhere he can go with a person. He LOVES to be petted – by anybody. He needs to learn to wait his turn. He’s still new to this life of retirement so I’m sure there will be more adventures and more updates.